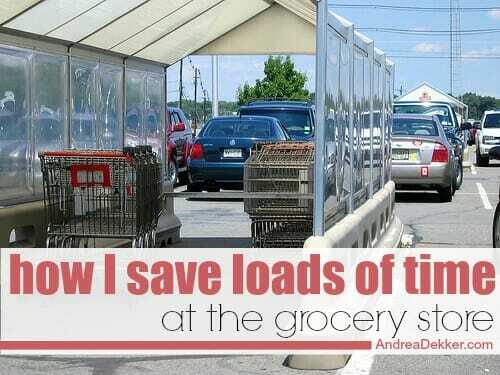 This is an updated post from one I shared 3 years ago — however it’s one of my all-time favorite time-saving tips (at least when it comes to grocery shopping), so I figured it was worth sharing again! Over the past 9 years of grocery shopping, the amount of money I spend at the store has risen significantly (read more about why in this post). 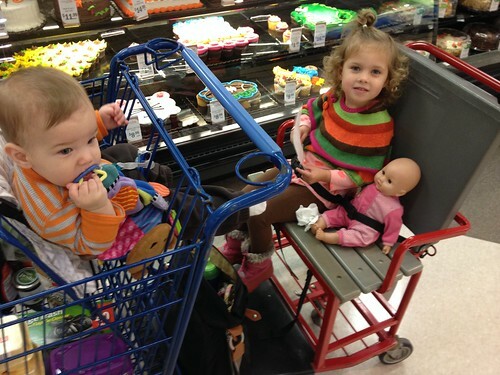 However, the amount of TIME I spend at the grocery store continues to decrease — even as I add more kiddos to the mix! Part of the reason for my super quick grocery store runs is because I’ve gotten good at knowing when our local stores tend to be the least busy and the most “stocked” and I try to visit during those times. However, the main reason I can get in and out of the grocery store in record time without forgetting anything (and letting my kiddos ride the horse) is because of how I organize my grocery list! Yes, that’s right. I actually organize my grocery list every week — but it only takes me about 5 extra minutes, and I guarantee it saves me at least 30 minutes or more in the store. So HOW exactly do I organize my list?? I organize my shopping list based on the store’s layout. For example, all the dairy items at my local Meijer are in the very back of the store, so I group all the dairy items together and put them at the top of my list. The baking aisle is usually my next stop, followed by the pasta aisle, the snacks/cracker aisle, then the breakfast aisle, etc. etc. By that time, I’m just about at the deli, which then wraps around to bakery, and ends in the produce section. My last stop is the frozen food aisle and then I make my way to the checkout. By grouping all the items on my grocery list by category (sometimes even by aisle) and then arranging my shopping list to start in the back of the store and work my way to the front, I eliminate TONS of wasted time walking aimlessly up and down the same aisle multiple times. I also rarely forget or overlook anything on my list. This does mean that I essentially make 2 lists every week. The first list is a compilation of things we ran out of during the week, things we need for the coming week’s meals, and anything that’s a really great deal in that week’s ad. I make the 2nd list by going through my first list and arranging everything by category and aisle (like I mentioned above). I cross off everything from the first list as I add it to the 2nd list, and then I eventually throw the first list away. This means I’m left with a neatly organized listing of every single thing I need to buy in order, based on my store’s layout. Do you categories and/or organize your shopping list? Yay! Someone else like me. We were discussing this at a lunch yesterday and my girlfriends thought I was slightly OTT. Although I go one step further than you, as have my list on an App on my iPhone (OurGroceries). As we need items, they are jotted onto a notebook near the fridge. I then quickly enter items into the app, which automatically sorts them into the categories (by aisle) I have set up. Makes it super quick to get around the store as each time you pop an item into the trolley, you tap it on the screen and it disappears from the list. The app also keeps your previous items, so you start to build quite a database, making entry even quicker. You can even email list to someone else to shop…yay! I do this too, but I use the iPhone app ShopShop. It allows you to have different lists (I have Walmart, Kroger, Costco and a separate list for school supplies the kids will need). It keeps a running master list of things you have ever put on it. You can then just add your items to the correct list and then reorder them. Writing my list was always the part I dreaded most! This makes it simple! I do the same thing. If I’m doing my once-a-month-epic-stock-up grocery trip, I make lists for my 5 and 7 year olds, organized by store layout with an equal number of “fun” items to find. I get everything big, heavy and breakable while the boys watch for the things on their lists. 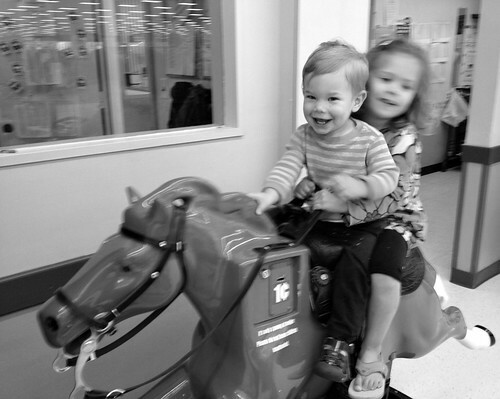 It keeps them engaged, keeps us moving through the store and is totally worth the extra time. We keep more normal hours now, but I still like to set an alarm clock to get up early on given days to get the shopping done. Especially in the summer when it’s so blazing hot outside. Once you learn “your” route through a store, it makes a huge difference. And you’re correct – taking that extra time to organize the list in that way is totally worth the time. I’ve done it for so long now that I *will* forget things if I for some reason don’t organize the list before I leave the house. I’ve tried using phone apps, but they just don’t work for me. Same with my day planner. It’s all on paper. However, I totally agree with you that earlier is better. I actually went shopping without kids at 6:30am on Memorial Day and the store was DEAD empty! I’m a bit spoiled as my store’s app already organizes my list by aisle. I never even thought to check my Kroger app to see if it did that! Checking now, and it appears to organize a list by department. Which is kinda how I shop, which is by department by aisle. Our Kroger recently remodeled, and now I can’t find anything, but I’m getting there. I agree that this saves so much time! My husband made a shopping list for me once and there was no rhyme or reason to it, but I didn’t look at it until I got to the store. It was mentally tiring to keep scanning the list and realizing I had forgotten things. I ended up rewriting the list. Could you do a post on the food you always keep “on hand”? I notice when reading a lot of your recipe posts, you usually mention it’s a quick recipe for you because you have the items in your pantry already. So what would those items be? What items do you automatically stock up on when you see they are on sale? Great reminder! I always do the same thing so I don’t think it is compulsive just practical! The only issue lately has been that my grocery store has been rearranging and renovating lol! I am getting to experience what unorganized shopping is like because every time I have gone over the past month things have moved (I only shop once per week so they can do a lot of rearranging in that time!). I live in Australia..Here the major supermarkets have apps where you can create shopping lists which will automatically be arranged in aisle order ..you have the option to switch store locations and list will be rearranged every time. In our household of four…there are three adults, all of whom could stop at a store on the way home. We use an app….Our Groceries. It is synced with our phones real time. So, for groceries, when you notice you need something, it goes on the list. We all can see what is needed and, when the item is purchased….it’s crossed off the list immediately for all of us to see. I was going to get an item I knew was on the list, but I checked before going and found my husband had already gotten it….pretty nifty. We can also set up lists for different stores…. sounds like you have an awesome system! I take it a step further – I created a shopping list based on the store layout, itemizing the items we usually get. It’s a Word document on the computer, and I print out a bunch on scrap paper and keep them in the kitchen. We add things to the list as need be, and when we do the weekly meal planning/grocery shopping. It’s so much easier for us! I recently came across an idea to organize a spreadsheet in this way (in order of store layout) and it is working SO wonderfully for me. Saving time at home and store. I print the sheet weekly, hang it from a magnetic clip on the fridge, and hi-lite as I use something up and as I go through the sale ad. I only have listed the usual items we shop for, cleaning and personal items included. I love it and wanted to share with you. As soon as my little guy is old enough, I plan to print a shopping list for him with a few pictures of items he can look for (might help keep him occupied). I use the Cozi app for my list but have it organized too. My five year old checks off the items as we go. Keeps him busy! I did make up a spreadsheet based on the store’s layout. I laminated and wrote with sharpie and then used fingernail polish remover to clean the sheets when I got home. It worked great until they rearranged the store. So I made another one based on the new setup. When they rearranged the store again, I threw away my spreadsheet and went another route. haha — yes! That’s probably the main reason I’ve never bothered to do a spreadsheet — because the stores always change things!